There are many things that may go wrong with your game development. Your models may have too many triangles for your target platform to handle, your algorithms may be too expensive for your CPU, and also you may be using too many materials so batching won’t work efficiently. These are difficult issues, and you as a game developer should always remember to keep good balance between visuals and performance. Yet, there are some things so simple that we often forget about their existence, but these can have a serious impact on your game performance. Last time, in Part 1, we talked about how texture import settings can kill your game performance. This time we will talk about sound import settings and why it matters. When working with Unity many things can keep their default settings set and everything will be working just fine. Of course, defaults are not optimal in most cases, but your game should be working OK. This rule unfortunately does not apply to Audio Clip Import Settings. Audio Clip (sound files) importing is working very similar to texture importing. Unity supports many different audio formats, but in the end it converts them all to preferred (by the engine) format. Currently, in Unity 5.2.1 this can be PCM, ADPCM, Vorbis/MP3 and HEVAG. Note that not each platform can handle all of these compression formats, and some platforms have only one format available (e.g. WebGL can work only with AAC audio clips). All Audio Clips are imported by default with “Decompress On Load” Load Type and “Vorbis” Compression Format. These are default import settings. You should be very careful with this setting, because using it on all your audio clips (Unity does it by default!) may consume large amount of your game’s memory! Do you see the info box on the screenshot? Original file size is computed to 35.9 MB and the imported size to 10.7 MB. This means that this Audio Clip will increase your game (archive) size by 10 megabytes, but playing it will require nearly 36 megabytes of RAM! This does not sound too scary if you’re building a game for PC where it is quite common to have 8 gigabytes of RAM, but mobile devices are still very limited on that manner. When I should use specific Load Type? Compressed In Memory – Audio Clip will be stored in RAM and will be uncompressed when played. Does not require additional memory for playing. Streaming – Audio Clip will be stored on a device persistent memory (hard drive, flash drive etc) and streamed when played. Does not require RAM for storing and playing (at least this value is not significant). Decompress On Load – Audio Clip will be stored in RAM uncompressed. This option requires the most memory but playing it won’t require so much CPU power as the rest. 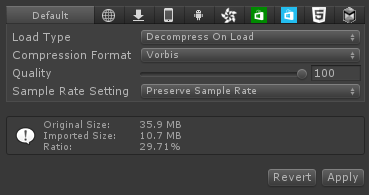 Use Load Type “Streaming” and Compression Format “Vorbis”. This combination will use the least amount of memory but will require some CPU power and disk I/O throughput. Use Load Type “Compressed In Memory” and Compression Format “Vorbis”. The only difference from the first solution is that it will exchange the disk I/O with some memory requirement. Note that you can adjust the Quality slider to decrease compressed clip size in exchange of sound quality. Usually 100 percent is a way too high. I would recommend something around 70 percent. Note that if you have more than 2 music/ambient sounds clips playing like this, it can consume a serious amount of CPU power. For frequently played and short Audio Clips use Decompress On Load and PCM or ADPCM Compression Format. When PCM is chosen, no decompression is needed and if audio clip is short it will load very quickly. You can also use ADPCM. It requires decompression, but it is much lighter to decompress than Vorbis. For frequently played but medium Audio Clips use Compressed In Memory and ADPCM Compression Format. ADPCM is around 3.5 times smaller than raw PCM and decompression algorithm will not consume as much CPU as Vorbis. For rarely played and short Audio Clips use Compressed In Memory and ADPCM. For the same reason as described in point 2. For rarely played and medium Audio Clips use Compressed In Memory and Vorbis Compression Format. This SFX might be too long to be stored using ADPCM and played too rarely, therefore additional CPU power required to decompress wouldn’t be a such pain. Always remember to check your Audio Clip Import Settings. These are silent performance killers of your game. Set these right, and you will get additional CPU power for things that matters. Also please take a look at the manual for technical information about import settings. Thanks for the post, I tried to understand this since time. On the “Sound Effects” part, when you say to use PCM or ADPCM are you suggesting to use them on mobile too (iOS and Android)? Or, it’s only Vorbis for mobile? Another doubt. For sound effects, when a sound is medium or short? Are these ranges good in your opinion? From my experience: yes, but it depends. I am suggesting to use PCM and ADPCM for up to 3 seconds sound effects. 3 seconds of stereo PCM audio will take 0,5 megs of memory, but 10 seconds it’s almost 2 megabytes. It really depends of how many sounds effect do you have but usually you may have 30-50 of those. Remember that storing audio as PCM will also store these files within game files. It will make your game bigger. If it is to much, change these ranges to your needs. What about when to use the “Load In Background” and “Preload Audio Data” options? Thanks for the information, greatly appreciated.